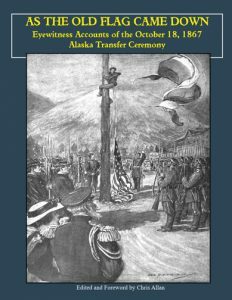 This 32-page booklet offers 16 eyewitness accounts of the 1867 Alaska Transfer Ceremony held in Sitka, Alaska. Drawn from newspaper stories, letters, and journals, there is one pre-transfer account, one post-transfer account, and 14 that describe the event. It also includes some 1868 photographs taken by Eadweard Muybridge. These accounts provide a rare opportunity to see how multiple observers remember and record the same events differently. Beyond the descriptions of the transfer ceremony, these accounts offer remarkable portraits of Sitka as a community in flux as the Americans arrive and the Russians depart and the Tlingits adapt to the new regime.